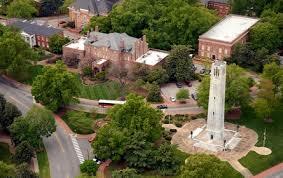 In 2012, there was an Early Voting site on the campus of NC State University in Raleigh, just like at AppState. Then Gov. Squishy took office, and every Board of Election in the state came under the partisan control of Republicans. So in the 2014 elections, there was -- surprise! -- no Early Voting on the NC State campus. In contrast, there was Early Voting on the AppState campus during the 2014 General Elections, but it took strong advocacy and a major lawsuit to accomplish it. No one was fighting for Early Voting on the NC State campus, at least not fighting in an effective way that produced results. The passivity at NC State may be about to end. There will be a push next week in the Wake County Board of Elections to reinstate Early Voting on the Raleigh campus. Everything will depend on how strong and committed the Democratic member of that county Board of Elections is. If he votes to go along (to get along) with his Republican brethren, who'll likely deny a campus site, then the whole push sinks. If the Democratic member votes "NO" and submits his own Early Voting plan, then the entire decision falls to the State Board of Elections, which has already been successfully sued for disenfranchising college-age voters and who might not want to be sued again. Naw, won't happen. We feel sure that Republican board member was taken to the woodshed sufficiently to beat any fairness out of his synapses.